Colorectal cancer (CRC) is one of the common cancers affecting people globally. Even though the incidence of CRC is low in India, there has been an increase in the past few decades. This can be attributed to the increase in urbanization and rapid changes in lifestyle among Indians. Screening can lower the mortality associated with CRC by detecting it at an early, intervenable stage. Early screening can also help to detect any clinically significant adenomatous polyps. CRC is also associated with a long preclinical phase; hence early screening can help in reducing the number of life-years lost because of cancer. 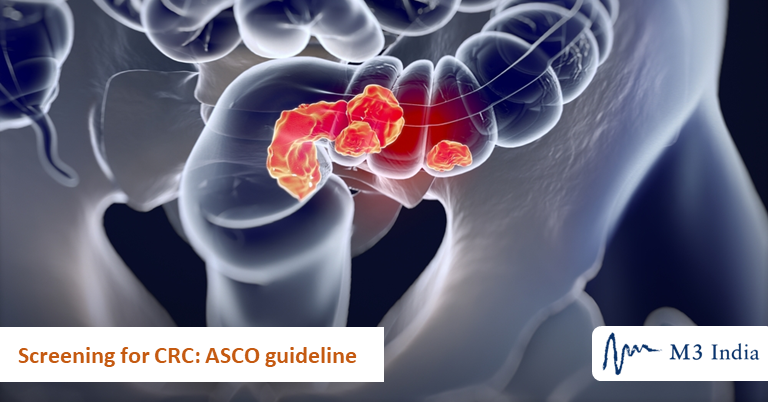 This ASCO guideline focuses on the role of the early detection of colorectal cancer and the management of any polyps found during colorectal cancer screening among those at average risk as well as the workup and diagnosis of colorectal cancer. Strategies for population-level early detection of colorectal cancer in high-incidence and resource-constrained settings. Reflex testing strategies for people with positive screening results. Strategies for people with premalignant polyps or other abnormal screening results. Methods for diagnosing patients with signs and symptoms of early colorectal cancer. The rationale for cancer screening is to prevent the development of malignancy during the 10 to 15 years after an instance of screening and ultimately reduce the deaths due to cancer. Asymptomatic individuals with no family history of CRC and aged 50 to 75 years have been designated as people at average risk. In regions with basic settings, the guideline recommends stool-based testing such as guaiac faecal occult blood test (gFOBT) or faecal immunochemical testing (FIT) every 1-2 years. In limited setting resources, individuals can also receive flexible sigmoidoscopy every 5 years or a combination of flexible sigmoidoscopy every 10 years and annual stool-based testing. In enhanced settings, colonoscopy (every 10 years) can be an alternative to all of the above-mentioned screening procedures; whereas, for regions with maximal settings, computed tomography (CT) colonography and FIT DNA test are two additional alternatives. The testing strategy for individuals with positive gFOBT or FIT or flexible sigmoidoscopy is a colonoscopy. Double-contrast barium enema can be an option if colonoscopy is not available. If colonoscopy referral is not available, those with a positive result from a barium enema should be referred to surgery to evaluate for surgical malignancy. When a clinician finds a lesion during a colonoscopy that could be an adenoma, they should remove it. The procedure should be performed by endoscopists who are well trained in polypectomy techniques. In cases presenting with large colorectal polyps that are not suitable for endoscopic resection or if endoscopic excision is not possible due to lack of expertise, clinicians should refer the patients for surgical resection. Iron deficiency anaemia, bleeding, abdominal pain, and change in bowel habits are some common symptoms suspicious of colorectal cancer. In such cases, colonoscopy with biopsy should be performed. If colonoscopy is contradicted, flexible sigmoidoscopy with biopsy may be performed with barium enema or CT colonography. Even though the rates of CRC are much higher in developed countries like the US, the incidence and mortality rates have been decreasing in the past 20 years. The American Cancer Society attributes this to CRC screening tests that allow for early detection and removal of polyps before progression to cancer. As per data from the American Cancer Society (2006 to 2010), the incidence rates have decreased by 3.7% per year among those aged 50 and above. Conversely, the incidence rate has increased by 1.8% per year among those younger than 50. Mortality rates have also declined, from 2005 to 2014, by 2.5% per year. CRC, although not a very common disease in India, will witness increased incidence rates in conjunction with the country’s development. It is thus vital that a practising physician possesses the required and expected knowledge to counsel patients regarding CRC and its screening. Implementations of effective screening programs in the target population should be made a top priority. Stratifying people into various risk categories should also be encouraged. Patient education also forms a vital component of the whole management procedure; they should be informed of the various risk factors and the available screening techniques. Implementation of this multi-disciplinary approach will certainly help tackle the rising CRC burden in India and improve disease outcomes.